I am hoping I can take my little journal on the plane. 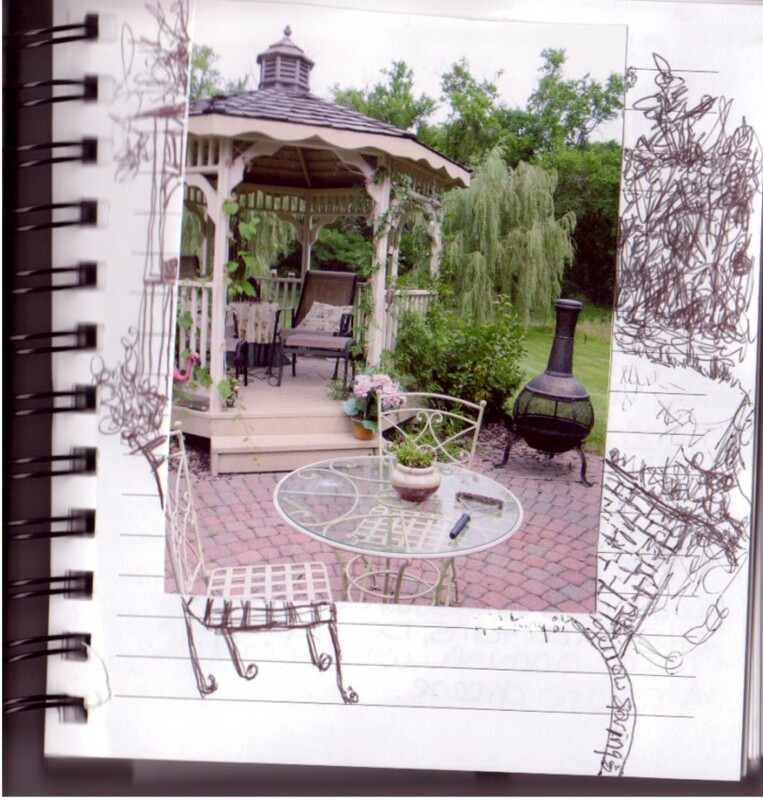 I am putting pics of home, family, recipes (texas ceasar salad -YUM) for mum and sis, and small sketches and observations as I travel. This is a photo of my back patio where mass quanities of tea are consumed and the mosquitos enjoy a bloody feast on my husband (they really seem to like his blood the best). Gannin Yem means going home and means the same in Norwegian. Here is some pictures at flickr of Newcastle/Gateshead created by JRStudio. Studio is cleared and ready but I can't concentrate or start new work because I am too excited and distracted about my trip home to England (in a couple of weeks). 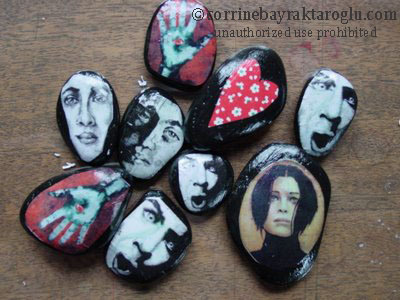 So I am just doing bits and bobs and had fun printing out some of my work to decoupage on stones, some of which I will take to England. 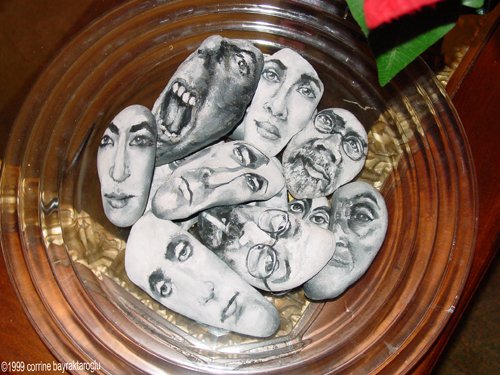 These were my very first stone portraits, which I put in a show in the Maryland Federation of Art in Annapolis. I was very encouraged because they both sold straight away. 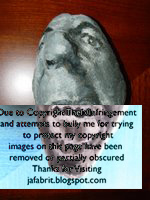 Why art out of necessity? 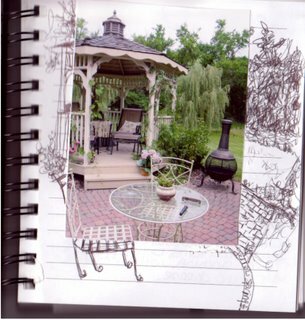 Well we had moved to New Jersey (this was about 8 or 9 years ago) and I couldn't get my studio up and running . 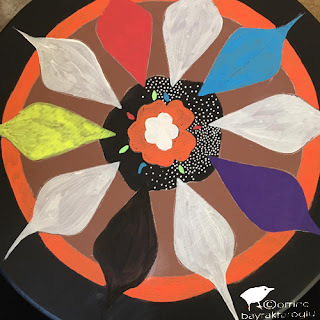 One day as my dh and I we were walking the dogs I was lamenting the fact I couldn't paint and my dh picks up a stone and said you could paint on this. I was like, "suuuuuuure". Well bless his heart because he really did come up with something. The closer I looked at the stone and the shape the more I was intrigued. I liked the idea of tricking people into wondering whether it was the shape of the stone that defined the features or the way I did the shadows/values. This is my ABSOLUTE favourite stone that now belongs to a dear friend of mine. 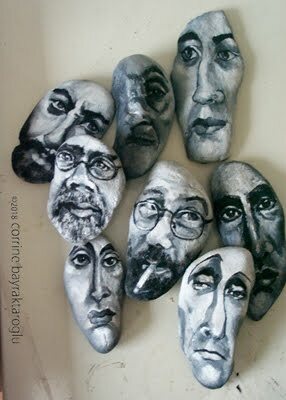 So I have to say my dear husband gets the credit (and he says any percentage of sales lol) for coming up with the idea of me painting faces on stones.